Millersburg, OH - "We will be starting our 2018 repair project on Monday, August 13th. The project will stretch from the Millersburg Depot south to just past the Millersburg Walmart near Tractor Supply. Though it's not official, the new trail section connecting Glenmont with the Mohican Valley Trail in Brinkhaven, is more or less complete. Recent reports show trail signage and striping has been completed, and the section is open to the public. This 7.4 mile segment brings the total Holmes County Trail miles to 22.9, with ~7 miles left to complete. That final section, between Glenmont and Killbuck will be developed sometime in the future. From their facebook page, "The Holmes County Trail will be closed for scheduled maintenance and bridge repairs October 18th & October 19th. "The closure will be south of Holmesville starting at TR 346 and continuing south for approximately 1.1 miles to the spur to SR 83. The Trail to Millersburg will be accessible from the spur. Additional closure dates may be needed..."
Yesterday (Sat 8/26/2017) they were laying Asphalt on the trail. I'm guessing the last section into Glenmont. They must be on a deadline to be working on a weekend. I biked the southern most (new) section of the Holmes County Trail from Brinkhaven (where it connects to the Mohican Valley Trail) to about 1.5 miles short of Glenmont. The trail is nicely paved (12' wide). There is only 1 road crossing. There are 3-4 roads that we go over on a bridge. Fencing is being put in along the trail. No railings or fencing at this point on the overpasses of the roads. They're replanting grass along the trail. From Brinkhaven to heading northerly to Twp Rd 7, it's a long even grade upwards. After you cross Twp Rd 7 it's a steep decline down to Glenmont. Also for those that start this trail at the Bridge of Dreams Trailhead, they have repaired the driveway from Hunter Road going up the hill to the parking lot. Also there used to be two 5' sections of the Mohican Trail heading towards the Holmes County Trail that was not paved. They have filled one of those sections with gravel. Hopefully they're going to pave that section and the other 5' section. Paving has begun along the trail section that extends from the Rt. 62 tunnel near Brinkhaven, to Glenmont, OH. Construction work has begun on the Glenmont to Brinkhaven section of the trail. This section is linked to the Mohican Valley Trail at Brinkhaven. Upon completion of this section, there will be only one remaining segment to finish: the Glenmont to Killbuck trail section. ...I talked to the trail administrator Jen Halverson a couple weeks ago and the plan now at Baddow Pass is to use the current trail up to Township Rd. 12, cross the road and follow the rim of the rock cut, back to the trail. Facilities: Trailside facilities at Hipp Station in Millersburg. See the trail map for more locations just off the trail. Worth Noting: Much of the trail features 2 side-by-side trails to provide horse & buggies a separate lane of travel. Fast forward to November 2017, and the new 7.4-mile section from Brinkhaven to Glenmont has finally been completed. This segment had been home to another railroad tunnel in the past. But plans to bore the 3rd tunnel were dropped, due to spring water seeping into the eastern portion of the remaining rock cut, causing drainage concerns. This reroute proved fortuitous. The road crossing is not only the high point and rough mid-point between two towns, but there are miles-long descents from this apex, regardless of your direction of travel. On our tandem, we managed to descend about 3.8 miles from Baddow Pass to the Rt. 62 tunnel without pedaling! The slope heading into Glenmont appears similar, though we soft-pedaled that section. Though gradual inclines/descents are common with rail-trail conversions, coasting for almost 4 miles is not. At least not in Ohio. And that makes this trail section rather unique. The gradient is also very steady, which allows riders to get into a comfortable climbing rhythm. It doesn't kick up noticeably until you near the apex, where the old railroad tunnel has been filled in. This last steeper section near the summit is what launches you back down the other side at a good clip. Be sure your brakes are in good working order. We rode the 15-mile section of finished trail that now extends from Killbuck to Clay Street in Fredericksburg. Much of this segment consists of two trails constructed side-by-side. The chip-and-seal lane is specifically for horse & buggy use, while the asphalt lane is for bikes. The two trails take up about 16 feet at their widest points. The modes of travel have been marked by posting signs alongside each trail that depict a bike or horse and buggy. During an early visit, the buggy side appeared to be a towpath-like crushed stone. But once the stone dust had worn away, the hard chip-and-seal fully revealed itself. And now that the trail has aged, the worn center track from the horses hooves demonstrates how the surface also acts as a protective coating for the asphalt base. This side-by-side trail configuration is unique among Ohio trails. Future plans are to build trail from Frederickburg over to Orrville, where the Heartland Trail is under development at this time. It's path is plotted to connect to the Towpath in Clinton, OH. These planned connections are thanks to the cross-state Ohio-to-Erie Trail, which is using these corridors to connect Cincinnati to Cleveland by trail. We started out from Hipp Station in Millersburg. This is an official trailhead with parking, water, restrooms and picnic area. The facility also houses the Holmes County Trail office. Heading south from the station, we passed under Rt. 39 heading away from downtown Millersburg. The bikeway bends to avoid a large parking area before resuming the route along the old rail corridor. 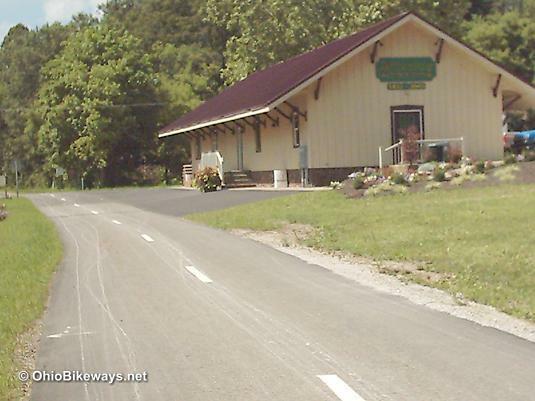 Before leaving the adjacent business district of south Millersburg along the east side of the trail, you may want to take advantage of the food and conveniences there. The trail connects with the Walmart parking lot making it a breeze to cycle to area stores or restaurants. The trail bed here has been built up with sandstone, slate and slag to elevate it from low lying ground. This provided a proper base for the first asphalt section that was put down in '05 and extended north to Sterling Road, just south of Fredericksburg. Continuing south toward Killbuck, we picked up an older paved trail segment before the surface narrowed considerably and became essentially a single asphalt trail not far from town. There's no question that tandem trails with mixed surfaces are quite wide, and therefore, expensive to build. It's likely that the original configuration was abandoned here due to cost concerns. But dual trail traffic is still encouraged, even along narrow sections. This completed section ends in Killbuck at the old yellow train depot near the intersection of Elm and Main Streets. The yellow building is the landmark to look for if you're searching for the trail in Killbuck. The trail will eventually continue westward from Killbuck to Glenmont. This is the final ~7-mile section to construct to complete the 29-mile Holmes County Trail. In June '09, an important final section of the corridor was obtained for trail use. The segment extends west of Killbuck to Rt. 52, roughly 2 1/2 miles along the old rail corridor. This was the last missing piece of the puzzle that will allow virtually all of the bikeway -- with a couple brief detours -- to follow the original railway route. After the return ride from Killbuck to Millersburg, we turned our attention north and headed toward Fredericksburg in Wayne County. This segment alternates between all-asphalt to a combination surface as it moves northward. I should mention that this rural trail passes through its share of woods and brush. And further on toward Holmesville it passes through wide open fields on either side. But a unique feature of the Holmes County Trail is the large wetland it traverses. In fact, you may want to ride early in the day during warm weather months. I would think mosquitoes could be an issue, though we've had no problems during late afternoon rides. As you near Rt. 83, you get a glimpse of the lighted tunnel under the roadway. This is an important landmark as it marks the spot of a nearby restroom and food stop. Take the asphalt spur to the right, just before you enter the southside of the tunnel, and ride uphill to the trailside restaurant just a few yards out of sight of the trail. The trail continues on to Benton Street in Holmesville where you'll encounter a short detour along village streets between completed trail sections. Finding enough room for tandem trails can be a challenge, particularly when private property and public roads squeeze along both sides of the former railway. One such trail section utilizes an adjacent lane to accommodate buggies and keep them alongside the trail until the corridor widens again. We reached Sterling Road just inside Wayne County, where the Holmes County Trail officially ends. Here, just outside of the next town, a single asphalt trail section continues on to Clay Street in Fredericksburg, the next destination along the trail. 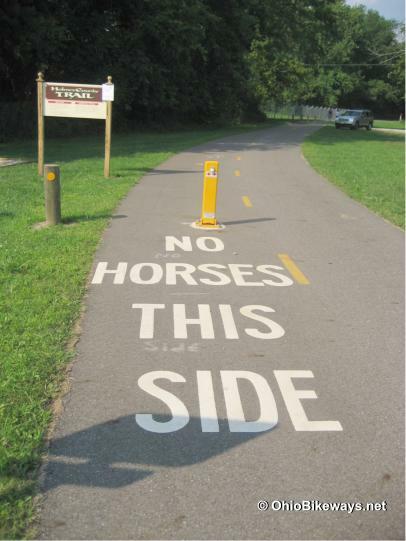 Now in Wayne County, the rules of the game are changed as a sign warns that horses are not allowed on their trail. Politics, economics and other factors often enter into the business of trail building as each jurisdiction crafts its own trail and rules. What is allowed on one trail, may be forbidden on another just down the line, as this junction demonstrates. Many trail projects have lofty goals, but the Holmes County Trail may be among the more ambitious with its tandem trail format. Essentially, this doubles the amount of trail surface that's put down and horse travel increases the wear rate on at least half of that surface. But the original goals of this multi-use corridor should not be forgotten or abandoned. Providing a safe lane of travel for buggies, bikes and pedestrians benefits everyone in the community. As mentioned above, the new Brinkhaven to Glenmont section is now open. That adds another 7.4 miles of finished trail, bringing the total to 22.4 miles. A ~7-mile gap from Glenmont to Killbuck remains as the only trail section yet to be completed sometime in the future.